I was inspired by this book. I love the color pink and thought it would be fun to host a pink themed play date for my daughter and her friends. I started out by reading this book to the girls. After I read the book the girls made necklaces out of pink beads and then colored pinkalicous pictures that I printed from Elizabeth Kann's website. Click HERE to go to her site to print the pictures and get other pinkalicious activity ideas. I also made pink play dough that I sent home with the girls. Click HERE for my favorite play dough recipe. Here is a close up of the refreshments. I hot glued paper cups to the bottom of paper plates to make pink serving platters for the refreshments. I saw this idea in a Martha Stewart magazine for kids parties. They suggested putting a big rock or something heavy inside of the cups to help keep the platters balanced. 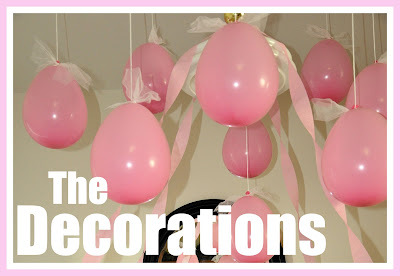 I hung lots of balloons from the ceiling and tied white tulle to the tops of them for the decorations. A picture of the guests dressed in pink. The guests took home a pink bag with pink treats and a container of pink play dough.